In the previous post about the poster from the City reminding us to clear our sidewalks - they'll take care of the bike lanes and roads - there was a discussion about using salt on the infrastructure. We salt our bike lanes and roads here in Copenhagen. Sometimes the wide stripe of salt on the bike lane is my weather report. If I see the stripe I know that snow is forecast and the city is ahead of the game with a preventive measure to ensure that the bike lane is as clear as possible until they can get out with the bike lane snowploughs. In Copenhagen, in the late fall, barriers are set up all over the place, along the roadside where trees and bushes are in the splashing zone of traffic. In the photo above you can see the black plastic shield to the right of the stylish cyclist. In many places they are wicker - woven branches - and they look more organic than black plastic. Nevertheless, the trees and bushes are protected from the salty, slushy spray after snowfall. Keeping the bike lanes clear is important. Not least for safety. But it is also a practical issue. 80% of Copenhageners continue to ride throughout the winter. That's roughly 400,000 people. If this massive group is somehow restricted in getting to work or school, imagine the chaos. Those who don't drive will have to take a bus or a train. 400,000 extra people all of a sudden standing at busstops and train stations throughout the region would be a logistical nightmare and a transport chaos. Parents would be late getting their kids to kindergarten or school. There would be lost man hours because of people arriving late or not at all. The bike lanes are kept clear for the most basic, practical reasons. 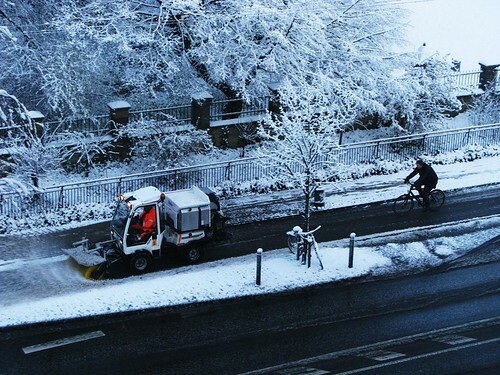 Even the small town of Höör, in Sweden - population 7000 - have bike lane snowploughs. Here's an earlier post about it.